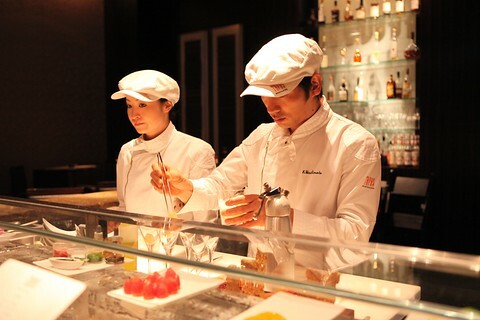 A friend and I went to try out the Molecular Tapas Bar in the Mandarin Oriental Hotel for dinner. 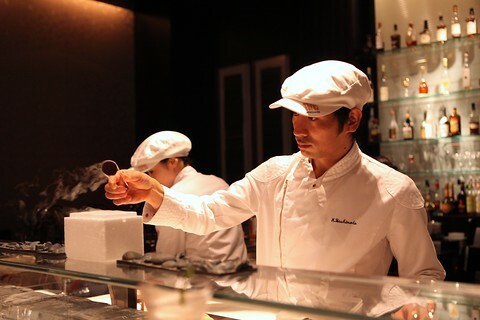 It really is a 6 seat bar where the specialty is Japanese inspired molecular gastronomy (or mole gastro as Henry likes to call it). It’s cool because the chefs prepare the meal in front of you and you can ask questions and chit chat. The view from the hotel lobby on the 38th floor was awesome. 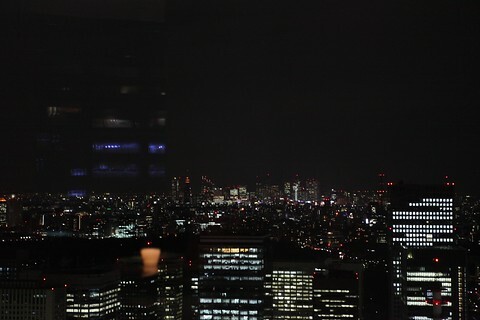 You can see Tokyo Tower in the distance. 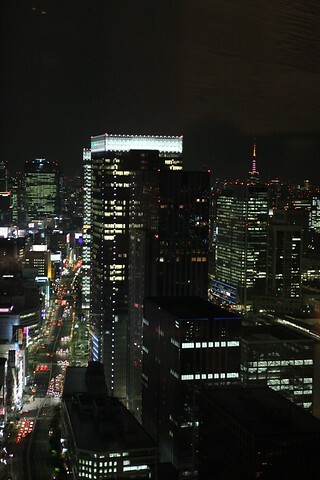 You can see Shinjuku in the distance. There were 20 total dishes listed on the metal menu. They used everything in the glass case in preparation for dinner. 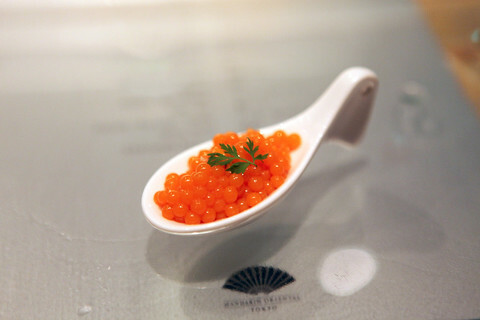 One of the signature dishes is carrot caviar which looks like salmon roe (ikura) but is actually carrot juice dropped into a solution with some gelatin which envelopes the juice into droplets. 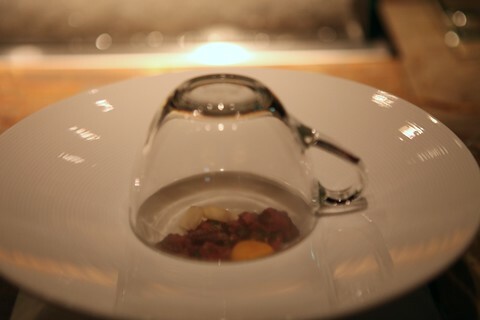 This dish was called smoke because smoke was trapped under the glass and once you lifted it and started to eat the smoke imparted some smokiness to the meat. That's mustard in the egg yolk looking thing. 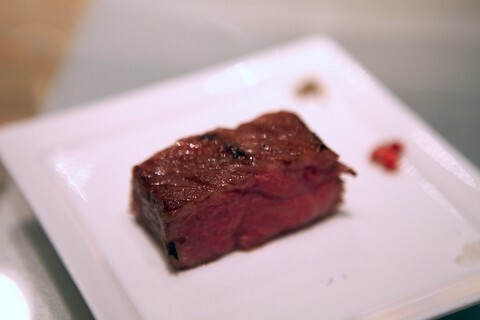 Wagyu beef that had been sou vide for 10 hours. It was so tender and juicy. Miso soup with tofu balls, seaweed powder and scallion oil. Yaki imo (sweet potato) was "cooked" in liquid nitrogen. The chef told us to put the whole thing in our mouths, close our mouths and bite. This is what happens. "Steam" comes out of your nose! 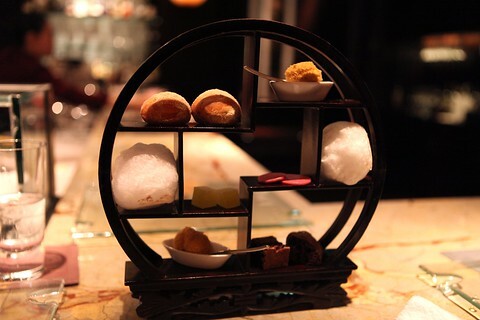 There were a bunch of little bites in this display from cappucino cotton candy, to a foie gras donut to chocolate pumice. Finally, we had fruit. The chef told us to try the lemons and limes first. 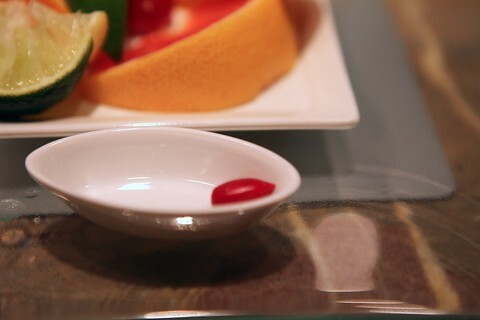 Then we had the miracle fruit which blocks your tongue's sour receptors! So after the miracle fruit we tried the lemons and limes and ALL the fruit tasted sweet. 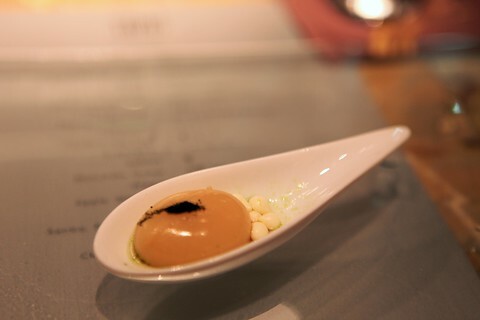 The cuisine was playful, delicious and pretty well-priced for a one-star Michelin restaurant. Overall it was a fun experience.